Currently cardiovascular risk management is mainly based on a review of traditional risk factors such as blood pressure, lipid levels (cholesterol), HbA1c and family history. High blood pressure or hypertension is an important risk factor for cardiovascular disease. An increased blood pressure leads the heart to work harder, which makes the heart and arteries more susceptible to injury. There are a number of anti-hypertensive drugs available to lower the blood pressure. Lipids include cholesterol, cholesterol esters, phospholipids, and triglycerides. High levels of triglycerides and LDL cholesterol in combination with low levels of HDL cholesterol are associated with atherosclerosis (the buildup of fatty deposits in artery walls that increases the risk for heart attack and stroke). Hyperlidemia treatment can include a drug-class called ‘statins’. Assessing the cardiovascular risk of a patient typically uses these traditional risk factors. Although these risk factors are very important determinants of cardiovascular risk, they do not always explain the increased cardiovascular risk in diabetes and renal failure patients. Clinical guidelines in most countries prescribe physicians to use cardiovascular risk scores such as Framingham, UKPDS risk engine and SCORE. These risk scores use multiple clinical measurements (blood tests) and calculate the cardiovascular risk of patient based on that. In daily practice these risk scores are rarely used by physicians because it requires a number of time consuming and expensive laboratory tests and the clinical performance is moderate. Find out more about how the AGE Reader adds clinical information to UKPDS. 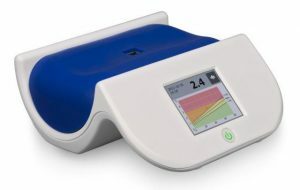 The extensively validated AGE Reader provides an immediate and non-invasive cardiovascular risk prediction. 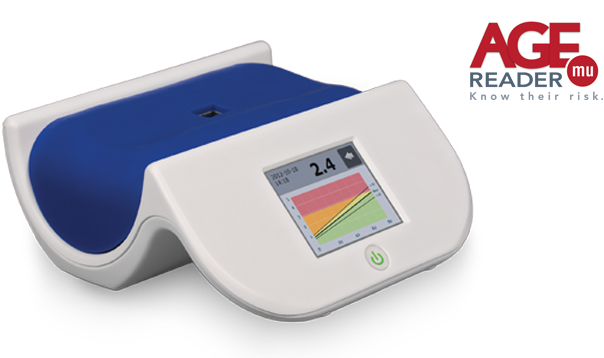 The AGE Reader is a very easy to use measurement system and as a result, leads to clinically valuable extra information. The AGE Reader dramatically therefore improves the cardiovascular risk prediction for diabetes, renal failure, and atherosclerosis patients. In addition, the method is convenient, easy to use and validated.